His Holiness the Dalai Lama during a long life puja offered at Tashi Lhunpo Monastery, January 2016. Photo by Bill Kane. 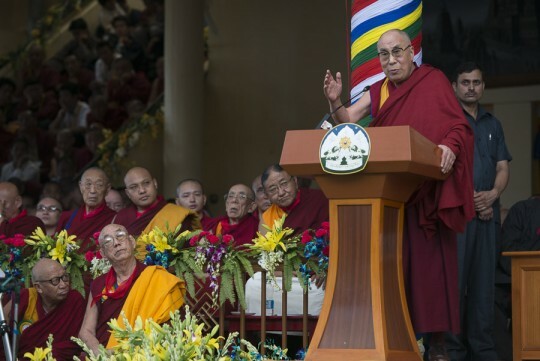 His Holiness the Dalai Lama speaking during celebrations honoring his 80th birthday at the Main Tibetan Temple in Dharamsala, HP, India on June 21, 2015. Photo/Tenzin Choejor/OHHDL via dalailama.com. As the spiritual guide for six million Tibetans, as Lama Zopa Rinpoche’s guru, as a recipient of the Noble Peace Prize, and as an advocate of each individual’s universal responsibility toward humankind and the environment, His Holiness serves as a living symbol for world peace. 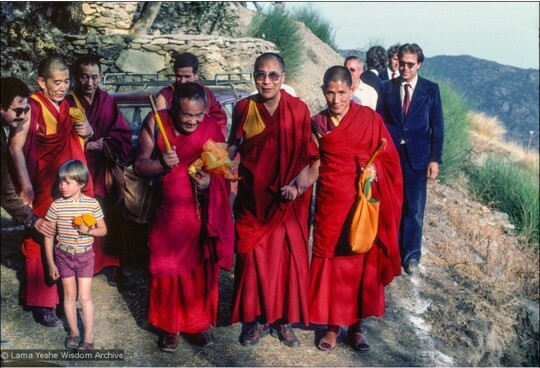 His Holiness the Dalai Lama with Lama Yeshe during His Holiness’ visit to O.Sel.Ling Centro de Retiros, Spain, 1982. Photo courtesy of the Lama Yeshe Wisdom Archive. 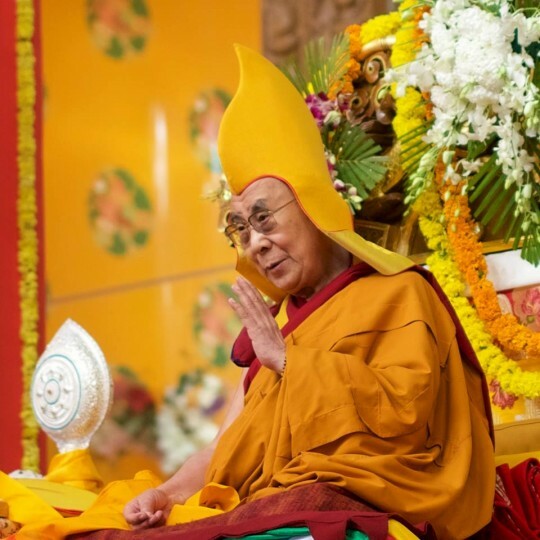 Since its inception, FPMT has turned to His Holiness the Dalai Lama for inspiration and guidance and attempted to promote and actualize His Holiness’ vision as much as possible and to create the cause for His Holiness’ long life. Over the years, His Holiness has visited many FPMT centers, including Istituto Lama Tzong Khapa, FPMT International Office and Maitripa College, Kurukulla Center, and Chenrezig Institute. 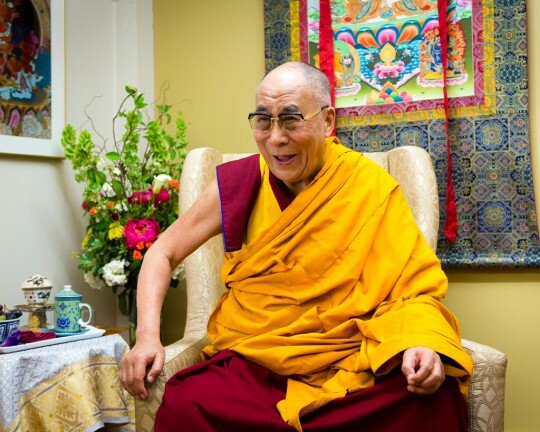 His Holiness the Dalai Lama during a visit to FPMT International Office, Portland, Oregon, US, May 2013. Photo by Leah Nash. 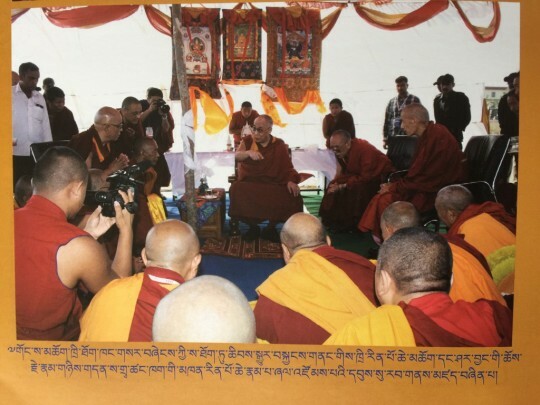 Throughout the past several decades, FPMT centers, projects, services and students have been involved in organizing and sponsoring His Holiness’ public talks and tours, supporting His Holiness’ projects, helping the Gelug monasteries in India and creating interfaith dialogues around the world, among other activities. Lama Rinpoche requested the FPMT organization to offer a long life puja to His Holiness the Dalai Lama every year. FPMT International Office has taken on this responsibility for over 20 years, and will continue to do so, on behalf of the entire organization. The tradition of debate in Tibetan Buddhism can be traced back to Lama Tsongkhapa, where the best scholars gather to hone their understanding of the Buddha’s highest teachings. His Holiness explaining the importance of establishing the Geluk International Foundation and offices. 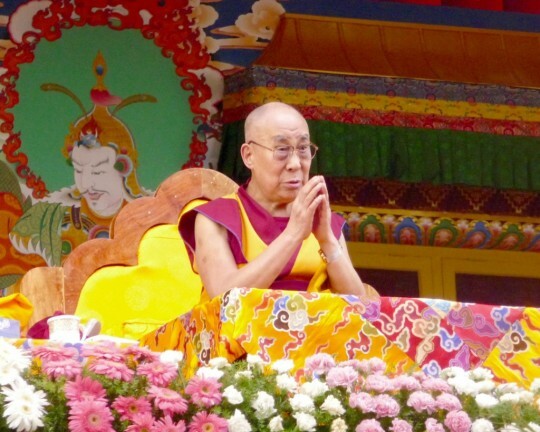 At a meeting held in South India in December 2014, His Holiness the Dalai Lama stressed the extreme importance of establishing the Geluk International Foundation and offices for the long-term preservation of the Gelug tradition. Lama Zopa Rinpoche immediately responded to this advice from His Holiness and offered a grant toward the construction of the building needed for this project. His Holiness the Dalai Lama during the Jangchup Lamrim teachings, Tashi Lhunpo Monastery, India, December 2015. Photo by Cynthia Karena. 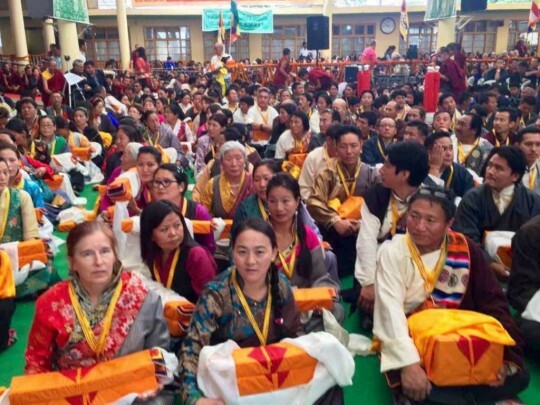 During the 2015 Jangchup Lamrim teachings, a transmission and teaching on 18 important lam-rim texts and commentaries, with His Holiness the Dalai Lama at the newly inaugurated Tashi Lhunpo Monastery, FPMT offered tea to 32,000 participants and money offerings to the 18,100 Sangha members present. Rinpoche composed the dedication that was made during these offerings. 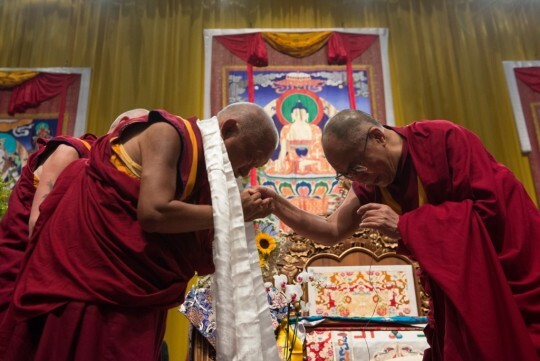 Lama Zopa Rinpoche with His Holiness the Dalai Lama, Italy, 2014. Photo by Matteo Passigato. Please rejoice in some of the ways that FPMT Charitable Projects is able to follow His Holiness’ most precious advice, create the cause for His Holiness’ long life, and offer support to His Holiness and the Tibetan people. May all the wishes succeed of the one savior of all sentient beings – His Holiness the Dalai Lama. 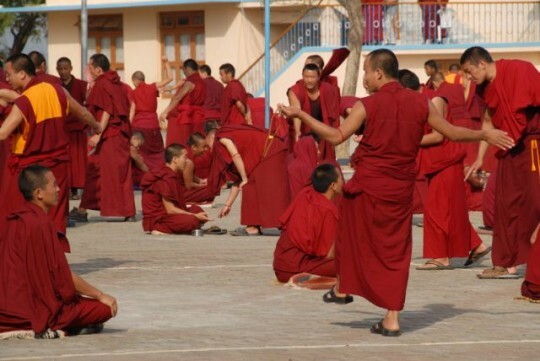 May Tibet gain autonomy immediately. May the pure Dharma shine fully in Tibet and China and the rest of the World and may there be perfect peace and happiness. May no one experience war, famine, sickness, or dangers of the elements, such as earthquakes. May all beings live with bodhichitta – cause no harm and only benefit others. May FPMT, its students and benefactors, always fulfill His Holiness’ wishes in all the future incarnations and become wish-fulfilling for all sentient beings. Please enjoy “In Praise of His Holiness the Dalai Lama,” composed by Lama Zopa Rinpoche, and Praise to His Holiness the Dalai Lama, a collection of comments from Lama Zopa Rinpoche’s Online Advice Book.